5K Run/Walk around Mason Regional Park to support in the provision of hope and healing to victims and survivors of crime through advocacy and the support of resources, information, and empowerment from the critical time after a crime occurs through the challenges and successes of surviving and thriving. It’s been said our volunteers do a little bit of everything – they help with set up and clean up, hand out food, snacks and drinks, collect registrations, direct walkers/runners, distribute t-shirts, goody bags, medals and a myriad of other tasks. Most of all, they have a lot of fun! Let us know if you are volunteering as an individual or if you are volunteering as a group. Food, Drinks and Fun will be provided for all volunteers. 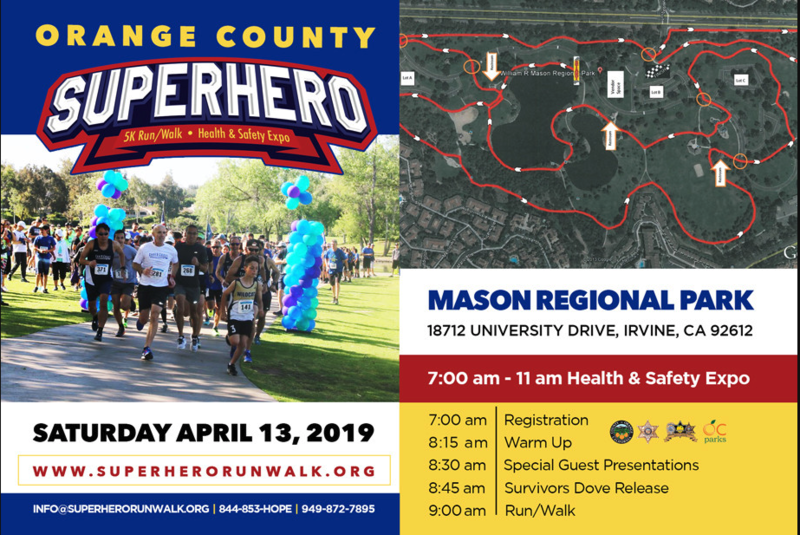 How was Orange County Superhero 5K Run/Walk?